While 100 yards looks like a long way, if you concentrate on the basics, hitting at this distance is relatively easy. Here's something to remember: What rides on your hip is a poor excuse for a real weapon. It doesn't matter who made it, what caliber it is, which custom features it has or how much it cost. It is just a handgun, a tool you carry because it's small and nifty and there's a remote chance you might need to defend yourself. However, no one but a fool would intentionally go into harm's way armed only with a handgun. It is a "sidearm," a tool with significant limitations. Handguns by their very nature are difficult to shoot well, compared to rifles. They lack penetration and have lackluster terminal performance and limited magazine capacity. On top of this, their range is limited, and most standard service rounds are easily defeated by body armor. Simply put, what it takes a master handgunner to accomplish with a tuned pistol, most any rifle shooter with a modicum of training can easily better with a rack-grade AKM. This is reality. One of the chief advantages a rifle has over a handgun is range. As the majority of violent encounters take place at very short distances, this is how a handgun is envisioned to be deployed--up close and personal. Due to this, many who practice with a handgun do so at "realistic" distances, usually 15 yards and less. Since the demise of the .357 Magnum service revolver in law enforcment circles, few regularly practice at 50-yard targets as was the norm decades ago when my stepfather was a patrolman. Even fewer practice at distances farther than 50 yards or have the confidence to engage at such extended distances. Now, what about a rifle? A substantially different animal, a well-made rifle teamed with quality ammunition can make hits at astonishing distances. As an example, in NRA High Power competition the 600-yard X-ring measures a mere six inches and is engaged with a service rifle using only the iron sights and a sling. Even a rifle as derided as a 7.62x39mm Kalashnikov will shoot into three to six MOA. This is plenty good to slap a silhouette at 300 yards. So without a doubt, a rifle--even the most abused Kalashnikov--has a huge advantage over a handgun. A skilled rifleman can stand off and easily engage at distances beyond the reach of most service pistols. To demonstrate what a service pistol is capable of at extended ranges, we put a Glock 23, Les Baer Prowler and Walther P99 to the test. But that last sentence isn't necessarily correct. A lot depends upon you, the man behind the gun. The truth is that most service pistols are actually capable of placing fire on targets farther than most realize. But you have to be able to make it happen. If your duty pistol is a Glock 23, and you're only proficient with it to 25 to 30 yards, that proficiency is on you, not the Glock. If your carry pistol is a snazzy, customized 1911, and you're only proficient with it to 60 to 75 yards, again, that's on you. 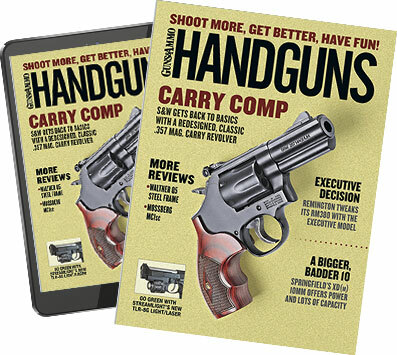 While it's true that a handgun is much harder to shoot and not as accurate as a rifle, nowhere is it carved in stone that pistols are limited to 25- to 50-yard distances. You can hit at 100, 150 or even 200 yards with one--if you are up to it mentally, know your pistol and practice. To better illustrate this, I recently gathered up three handguns and put them to work at extended ranges. This exercise was performed solely to demonstrate that a service pistol is not limited to 25 yards. The three pistols selected were a Glock 23 and Walther P99--both in .40 S&W--and a Les Baer Prowler in .45 ACP. The Glock and Walther were both used, in stock condition with no modifications. They are simple, service-type pistols such as what an officer might be issued or a citizen might carry. For ammom we selected Wolf Performance Ammunition's .40 S&W 180-grain FMJ and .45 ACP 230-grain FMJ Holsters and mag pouches were from Blade-Tech. The Les Baer, on the other hand, is one of the best of the breed of well-made 1911s. My example was barely broken in, with only 2,000 rounds through it. As the basic 1911 design remains timeless, I felt it only prudent to include one in my testing. To demonstrate what a handgun is capable of, these three pistols were shot at a variety of ranges. I baselined them at 25 yards, then moved to 50 yards. After this I doubled the distance and shot them at 100 yards. Finally, I doubled the distance again and walked them out to a full 200 yards. (Left) A look at how these pistols performed at 25 and 50 yards. For inexpensive ball, the Wolf ammunition performed quite well. (Right) Think 100 yards is too far for a service pistol? Think again. Groups consisted of firing a minimum of four five-shot groups from the prone position. All groups were fired from the prone, rather than off a benchrest, to determine what these pistols were capable of under real-world conditions. After all, who carries sandbags and a bench with them? Targets consisted of standard IPSC silhouettes, 30 inches tall and 18.25 inches wide. For ammo, I selected two loads from Wolf Performance Ammunition. The .40 S&W Glock and Walther were fed Wolf's 180-grain FMJ load while the .45 ACP Les Baer received Wolf's 230-grain FMJ load. Both of these loads are steel cased, Boxer primed and noncorrosive. Wolf ammunition was selected because it is quality practice ammo at an extremely reasonable price. And we all know that the less ammo costs, the more we can practice. I also selected it to show what these pistols are capable of with simple, inexpensive ball rather than fancy match ammunition. Blade-Tech holsters and magazine carriers were used during testing simply because they're what I carry on a daily basis. I've found them to be rugged, well designed and comfortable. To start out things, I began by shooting the Glock 23 at 25 yards. Here, the Austrian pistol easily plunked five rounds into a best of 2.5 inches and averaged three inches. Point of impact was right on point of aim. Moving back to 50 yards, I noted that the front sight looked mighty wide in relationship to the silhouette. Of course, this was just a prelude of things to come. I fired a couple of groups to get a feel for this distance and then settled down to fire for record. Taking my time with the Glock, I managed a best of 4.12 inches, and I averaged a very nice 4.81 inches at this longer distance. Again, the group was nicely centered and only slightly below my point of aim. Stepping back to 100 yards, I indexed the front sight on the neck of the silhouette and wished for a better trigger. Still, even at a full 100 yards, the compact Glock proved capable of easily keeping all its shots on a silhouette. My best group was five shots into 8.5 inches with an average group size of 10.3 inches. (Left) One hugely popular carry gun is the Glock 23 in .40 S&W. Our test pistol was in used but excellent shape with several thousand rounds through it. (Right) For our 1911, we chose a Les baer Prowler. Les Baer has a reputation for building extremely accurate 1911s, and this one lived up to its name. Next I switched to the Walther P99. This tightened up groups a bit, with a best of five shots into two inches and an average of 2.65 inches at 25 yards. Moving to 50 yards, the Walther surprised us with its accuracy. Here it posted a best of 2.37 inches and averaged a mere 3.31 inches. However, at 50 yards I did note that this pistol was grouping noticeably high and to the left. This began to be a real problem at 100 yards. Here, I had to hold at the right edge of the silhouette. Yet even so, the Walther punched five rounds into 6.5 inches and averaged 8.75 inches. Switching to the Les Baer was like night and day compared to shooting the Glock and Walther. The crisp trigger and well-defined adjustable sights made the 1911 substantially easier to shoot well. Regarding accuracy, it was a shooting machine. At 25 yards, the Baer averaged an impressive 1.25 inches with the Wolf ball. Moving back to 50 yards, the Baer poked rounds into a best of 2.25 inches. Average group size at 50 yards was an impressive 2.62 inches. This is better than what the Walther averaged at 25 yards. Our best group with the Walther at 200 yards out two out of five on target. Going prone at 100 yards, I held on the head of the silhouette and let fly. The Les Baer Prowler responded by tossing five of those fat, 230-grain FMJs into 5.5 inches, and it averaged 7.1 inches. The 5.5-inch group was as good as some 100-yard groups I've fired with AKMs. Secure in the knowledge that all three pistols were well capable of keeping all five rounds on a silhouette at 100 yards, I moved on. Next I posted a circular cardboard backer 37 inches in diameter. Onto this I stapled a plain-white IPSC target. Then I moved back to 200 yards. This portion of testing was conducted in a gravel pit to simplify getting on paper at this distance. Dust from a bullet strike would allow me to quickly find the required elevation and windage. Then, once I knew where my point of impact was, I'd fire for record. At this distance I decided it prudent to start with the Les Baer. After two sighter shots, I slowly fired five rounds. Two hundred yards is a long way for a .45, and there was a noticeable pause between the jump of the gun and a hefty thwak being heard as the FMJs struck plywood. After firing my five, I stood up and walked downrange to see if I'd had any luck. Walking up to the target, I was pleased to see four .45-caliber holes in the silhouette and one to the right in the backer. Putting a tape to it, I found the group to be 18 inches high and 23 inches wide. Three shots had struck the chest and one the head. While this was impressive, the question was, is this type of performance repeatable? To find out, I returned to the firing line and proceeded to fire three more groups. The second placed three rounds on the silhouette. Total group size for all five rounds measured 18 inches high by 25 inches wide. The third group put four rounds on the silhouette and kept all five in 17 inches high by 12 inches wide. The last group placed three rounds on the silhouette and had a total group size of 11 inches high by 29 inches wide. Out of 20 rounds fired at 200 yards, 14 hit the silhouette. Average vertical dispersion for all rounds fired was 16 inches. Average horizontal dispersion for all rounds fired was 22.25 inches. While I couldn't keep all five rounds on a silhouette at this distance with this load, I think the results speak for themselves. In a pinch, a tuned 1911 can easily put rounds on a target 200 yards away. Switching from the expensive, tuned 1911 to the Glock 23, things became a bit more difficult. At 200 yards I had a difficult time just trying to keep all five rounds on the 37-inch backer. backer. Group size for these four rounds was 10 inches wide by 20 inches high. The second group put two rounds on the silhouette and two rounds on the backer. Group size was 24 inches wide by 18 inches high. The third group put three rounds on the silhouette and the other two on the backer. All five rounds were in a group 25 inches wide by 15.5 inches high. Notes: Velocity readings taken 12 feet from the muzzle with the Oehler 35P chronograph. Groups are an average of four five-shot groups fired prone. Finally, the last group put one round on the silhouette and two on the backer. All three rounds were in a 16-inch triangle. Out of 20 rounds fired, seven hit the silhouette. While this doesn't look very promising, it should be noted that at least one round out of every group did hit the silhouette. While the Walther had handily outshot the Glock at 25, 50 and 100 yards, such was not the case at 200 yards. At this distance their performance was about equal. Only once did I keep all five rounds on the backer with the Walther. This group put two rounds in the silhouette and measured 25 inches high by 19 inches wide. Out of 20 rounds fired, six hit the silhouette. I did fire one group with the Walther where all five rounds missed the silhouette at this distance. In the P99's defense, I never touched the rear sight to zero it for windage. This pistol belongs to a friend who's left handed, and it hits point of aim for him, so I refrained from adjusting his sights. Here's the very first five-shot group fired with he Les Baer at 200 yards. Four out of five--not bad. So what did this exercise prove? Simply that all three of these pistols are easily capable of ruining a criminal's day at 100-plus yards. However, I must add that three things are required to make consistent hits at extended distances with a handgun. These are having the right mindset, a solid position and a knowledge of where to hold at different distances. Remember, shooting is 95 percent mental and five percent physical. If you believe you can do something, then there's nothing to stop you but yourself. Unfortunately, the reverse is also true. If you don't believe you can hit a silhouette at 100 yards with your Glock 23, you never will. In order to get the most from your handgun, you'll need a solid, preferably supported position. Just like with a rifle, you only shoot offhand if you have to. If support is available, use it. Nothing around you? Try prone. While this position is not always viable, it is very stable, allowing you to get the most out of your handgun. If no support is available and going prone is not an option, then use yourself for support. Just like with a rifle, you're looking for bone-on-bone contact for solid support. It takes very little time to snap into a kneeling position or a modified "rice-paddy prone." The latter is very quick to get into and out of yet is very stable. Remember, there are no rules on the street. Use whatever you can for support to help you accurately place your rounds. To hit your target, you'll first need to know just how much front sight to hold up at certain distances. You find this out only by spending time on the range. Pick a load, then buy a lot of it. Start at 25 yards, and shoot some groups. When you feel comfortable, move back to 50 yards. Don't be discouraged if your initial groups are bucket-size. Just concentrate on each shot. When you are comfortable with your groups at 50 yards, write down the difference between your point of aim and point of impact at this distance. Then move to 75 and 100 yards. Again record your point of aim at each distance (draw a picture if you have to) for future reference, then memorize it. Why all the fuss? Well, making hits at long range in a gravel pit is one thing. You can see the dust strike and quickly correct. In the real world, you probably won't have that luxury. So know where to hold. When you get past 100 yards, I suggest putting a larger backer behind your target for any rounds that might miss the silhouette. This will provide you with feedback to help determine the center of your group and where to hold. Also, while it's a good idea to place an aiming point on the silhouettes to start, graduate from needing one as soon as possible. So when you're able, remove the target and shoot at just a blank silhouette. Don't stop practicing at 15 yards and less. But I suggest working some longer shots into your training as well. It may save your life.